Another Massachusetts jurisdiction shot down the idea of red-light cameras. Recently, residents gathered at the annual meeting in Raynham and voted 104 to 95 against the idea of petitioning the legislature for permission to install red-light cameras at a number of intersections. Reynham has a population of about 11,000 and all qualified inhabitants were allowed to vote on the issue. Residents want to keep enforcement efforts as they are and don’t agree that these cameras will be beneficial in preventing intersection car accidents in Massachusetts. Currently, our state does not allow these red-light cameras. Lawmakers have been able so far to resist all attempts to pass authorizing legislation. American Traffic Solutions (ATS) has been trying to take their campaign to small town officials, according to The Truth About Cars. ATS is a privately-owned company that keeps looking at city officials as a means for building new business. Our Boston personal injury attorneys understand that drivers firmly stand on both sides of the issue regarding these red-light cameras. According to the Insurance Institute for Highway Safety (IIHS), roughly two-thirds of drivers in 14 big cities that have the cameras support their functions. A recent study from the IIHS even concludes that these cameras have reduced the rate of deadly red light running accidents by nearly 25 percent in these same cities. ATS is no stranger to Massachusetts lawmakers as they’ve previously hired marketing companies to try and persuade Boston officials to launch the red-light program. Previous efforts cost more than $161,000. Although a majority of big cities support the use of these cameras, there are some opponents. A number of residents view these cameras as an invasion of privacy and tools that are being used specifically to generate revenue for the city. Either way, the IIHS reports that that the issue has gained more supporters than opponents. The Institute study that was released earlier this year illustrated just how effective these cameras are. The study took U.S. cities with populations over 200,000 and compared those that have cameras to those that don’t. These red-light cameras reportedly saved nearly 200 lives in cities that had cameras from 2004 to 2008. The Institute estimates that more than 800 lives have been saved if these cameras had been operating during those years in all large U.S. cities. -More than 9 of 10 drivers surveyed reported that running a red light is unacceptable. -More than 8 of 10 say that it a serious threat to personal safety. 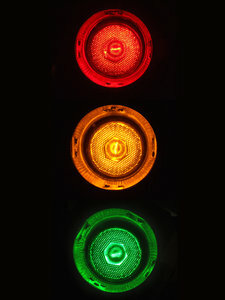 -Two-thirds of drivers support red-light cameras. -More than 40 percent strongly favor the cameras. -A majority of them say the cameras have made intersections safer. -Half of surveyed drivers know someone who has gotten a ticket at an intersection with a red-light camera. -Nearly 20 percent have gotten a ticket themselves. -Only about half of drivers that received a ticket believe that it was deserved. -About a fifth of drivers said that they support cameras but are opposed to right-on-red enforcement. -More than 40 percent of drivers support using cameras for right-on-red violations.